Retiring in 2007 after an astonishing 37 seasons in the sport, ‘Smiler’ has stamped the Wainman name on the sport so firmly that the two have become almost synonymous. Even in retirement, he retains an involvement that few can only dream of. Debuting in 1970, it was two years before Frankie made it to red top, with his first final win coming in 1973. Thereafter, he was an ever-present in the upper reaches of the points table. A solitary World Championship – in 1979 – was scant reward for someone of Frankie’s skill and dedication, but serves to underline the unpredictability of the sport. After so many heartbreaking second place finishes in the points, Frankie finally secured the silver roof in 1984 and repeated the feat in 85 and 86. One of the sport’s inaugural Superstars, Frankie sported the flashing lights, in an unbroken sequence for over 10 years, the longest period from the inception of the grade. Throughout the 1990s and into the new Millennium, Frankie raced increasingly more for pleasure, yet he was still a proven race winner, posting his last Final victory in 2006, an effort that saw him return to the Superstar grade for one last hurrah. 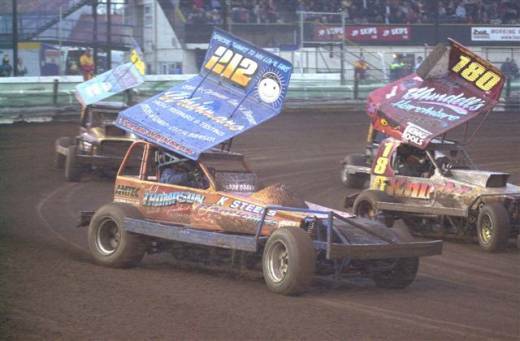 Frankie has two sons racing in BriSCA F1 Stock Cars; Frankie Wainman Jnr (#515) and Daniel Wainman (#212). Daniel started racing the following year after his fathers retirement from the sport and took over the mantle of the 212 number. Further Photographs of Frankie Wainman can be found on Brian Watson’s excellent website Ovalaction.com – Click HERE to be taken direct to Frankie Wainman’s page.